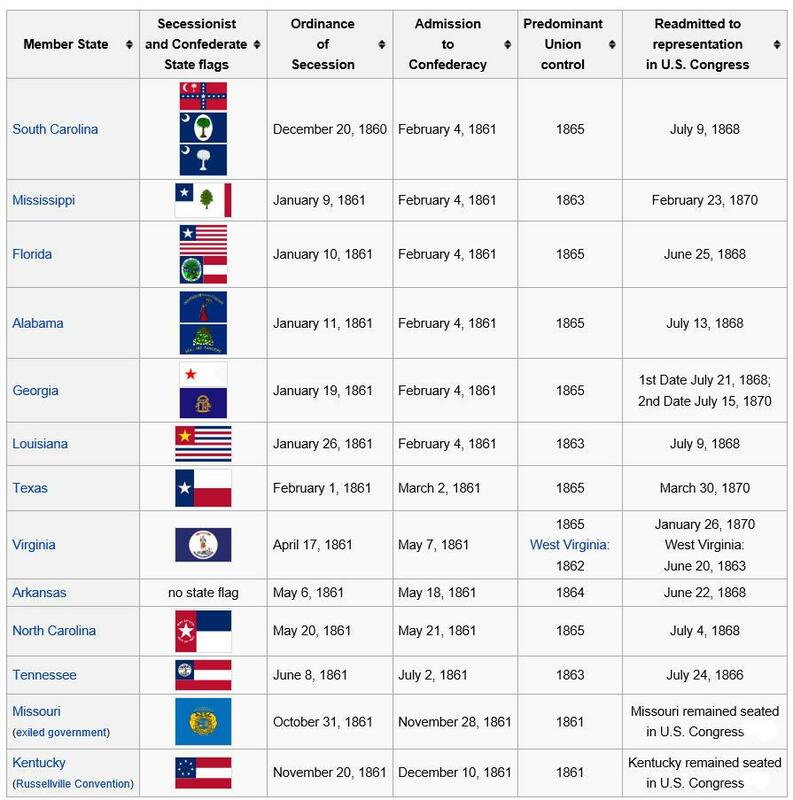 The CSA for formally proclaimed in February 1862 by the seven States that had seceded from the United States following the election of Lincoln. The capital was moved to Richmond Virginia in May 1861. Meanwhile four other states joined the Confederacy and two other States had both Confederate and Union government factions (Kentucky and Missouri). Maryland had pro-secession feelings but Lincoln arrested or barred the strongest pro-Southern State legislators from their constitutional duties to prevent enactment of a secession declaration. Maryland did provide many units that fought with the Confederacy against the Federals. In addition there was the Territory of Arizona encompassing much of today's States of New Mexico and Arizona. After secession, the seceding States called for the US to abandon their military bases in their territories. In April 1861, Lincoln sent a replenishment ship to Fort Sumter in the harbor of Charleston South Carolina. This caused the bombardment of Fort Sumter and launched the War for Southern Independence. These bonds were issued to support the Confederate Government and for defense of their territories from Northern aggression. Scott no. 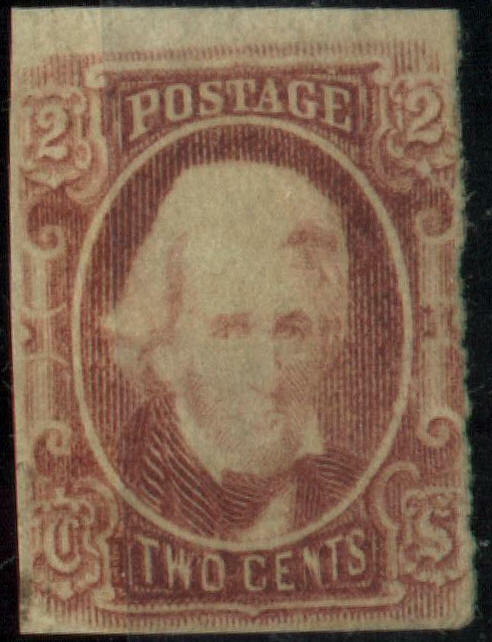 2a featuring Thomas Jefferson - 10 cents - issued November 1861. Printed by J. T. Patterson & Co.
Scott no. 4 picturing Pres. 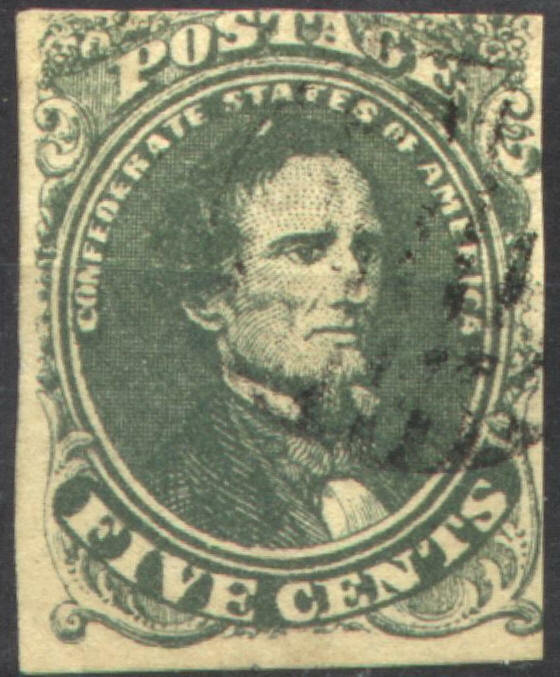 Jefferson Davis - 5 cents - issued March 1862. Scott no. 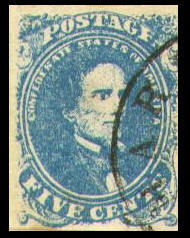 5 featuring Thomas Jefferson - 10 cents - issued around March 1863. Printed by Hoyer & Ludwig. Scott no. 7 picturing Pres. Jefferson Davisn - 5 cents - issued August 1862. Printed by Archer & Daly. Scott no. 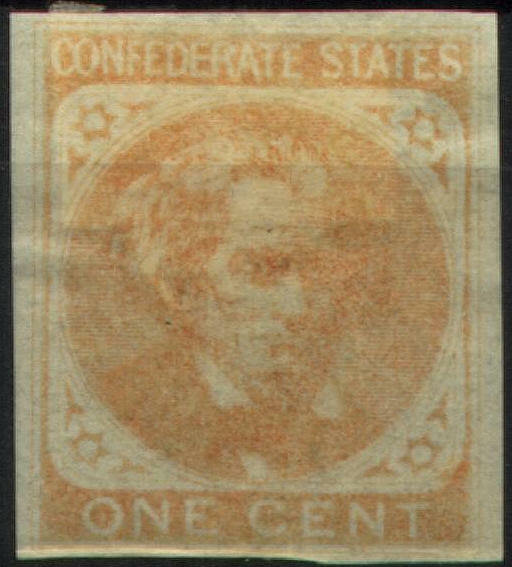 8 featuring Andrew Jackson - 2 cents - issued May 1863. Printed by Archer & Daly. Scott no. 11b picturing Pres. Jefferson Davis - 10 cents - issued April 1863..
Scott no. 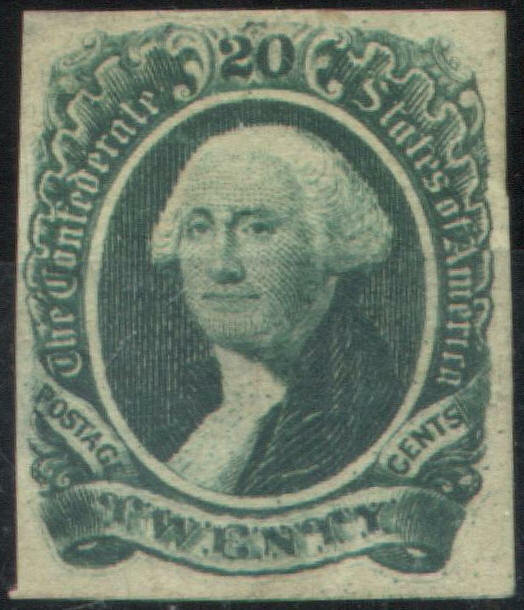 13 featuring George Washington - 20 cents - issued June 1863. Printed by Archer & Daly. The Confederate Post Office Department was authorized in February 1861 and became functionally operational on June 1, 1861. In the interim USA postage stamps were valid to a point. After they were invalidated a system of local "postmaster provisionals" were used, some in the form of stamps and some as stamped envelopes until CSA stamps became available. Many cities and towns issued these but most are quite rare today. 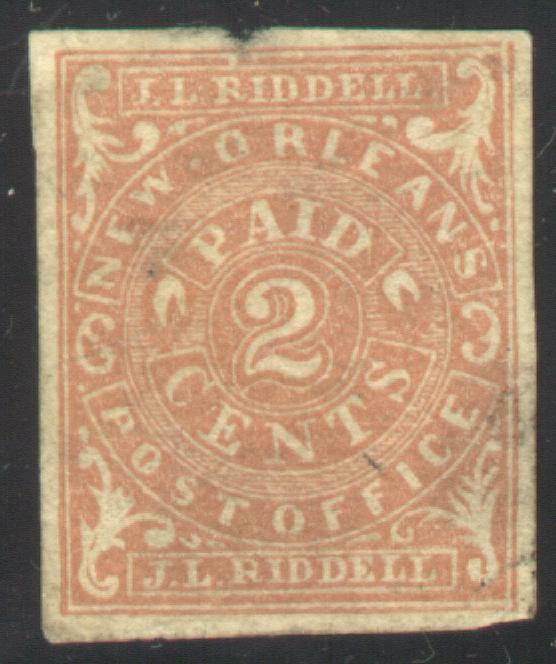 Here is an example of a stamp issued by J. L. Riddell postmaster of New Orleans. 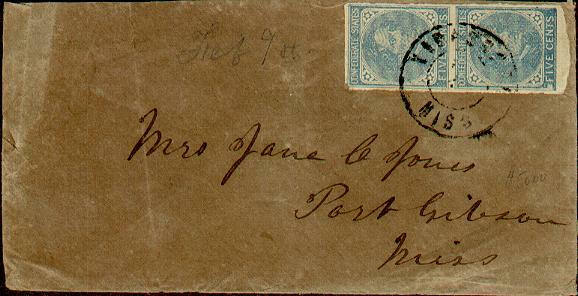 Here is an example of a provisional stamped envelope issued by the postmaster in Marietta, Ga.
Official CSA postage stamps became available as early as October 1861. Postmaster provisionals were still used when postage stamps were unavailacle. 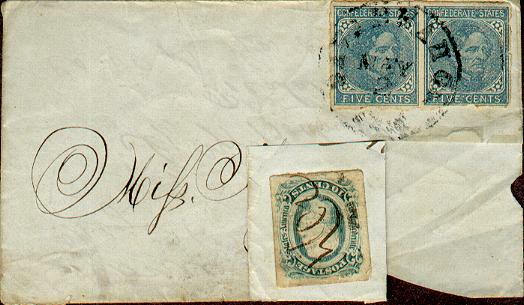 Here is a collection of covers (envelopes) postally used in the Confederacy, one from each State. 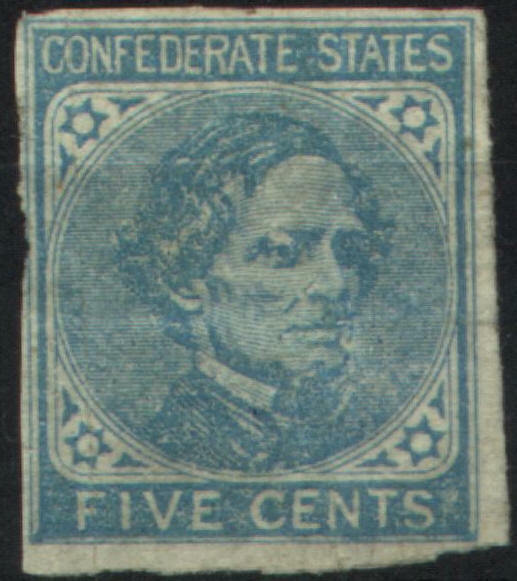 Confederate Territories such as Arizona and Indian Territories were also utilized but these covers are extremely rare. Posted from GAINSVILLE, ALA., on February 8 probably 1863. Has a pair of Scott no. 7 (5 cents) to meet the 10 cents rate then in effect. These stamps were printed by Archer and Daly of Richmond from plates provided by De La Rue & Company in London, England. 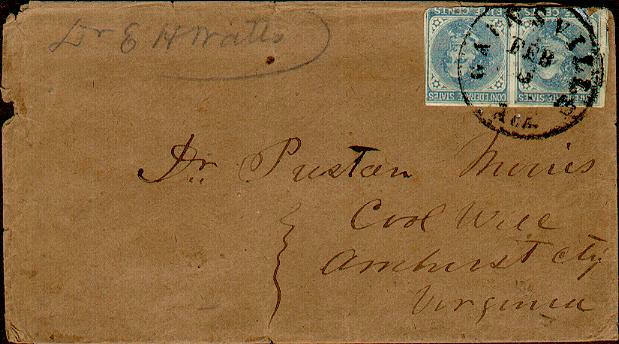 The cover was addressed to Dr/ Preston Morris, Cool Well, Amherst County, Virginia. 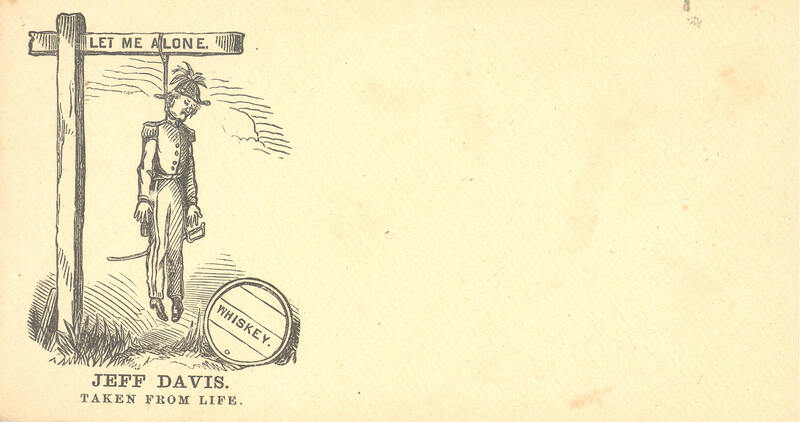 Adversity Cover posted from LITTLE ROCK, ARK on May 5, 1863 (?). Has a pair of Scott 7. 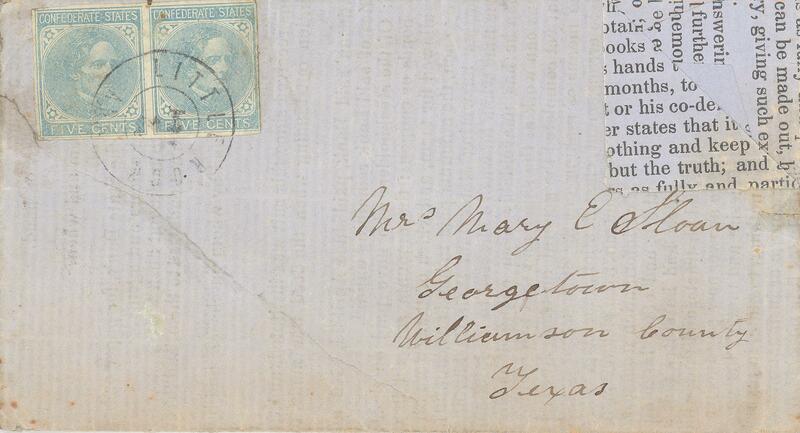 Addressed to Mrs. Mary E. Sloan, Georgetown, Williamson County, Texas. An adversity cover is when there was a shortage of paper, folks resorted to using forms, wallpaper, etc. This is on an old printed form. Posted from QUINCY, FLOR on July 13. Has a single of Scott 12. 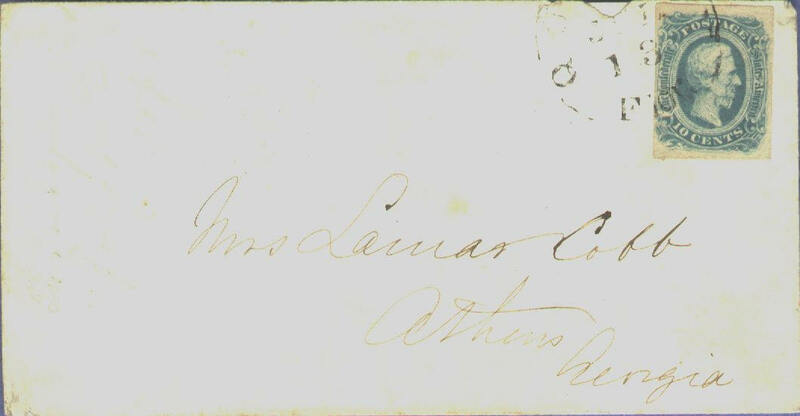 Addressed to Mrs. Lamar Cobb, Athens, Georgia. Posted from MARIETTA, GEO., on May 2. Has a single of Scott no. 1. 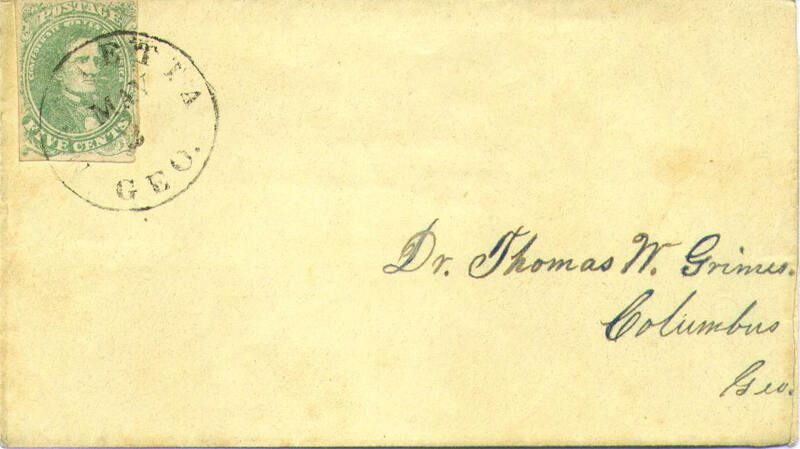 Addressed to Dr. Thomas W. Grimes, Columbus, Geo. Mailed from NATCHITOCHES, LA. Has a pair of Scott no. 7, though two different printings, one dark blue and the other blue. Addressed to Capt. Joseph L. S. Kirby, Care of Genl. E. Kirby Smith, Tans-Mississippi Department, Shreveport, La. Capt. Kirby enlisted on July 18, 1861 at Richmond where he mustered into the4th Co. Virginia Infantry Howitzers Light Artillery as a private. On November 2, 1862 he was promoted to3nd. Lieutenant and commissioned into the 4th Company CS Engineers Corps. He took the oath at Galveston on June 20, 1865. Gen Smith's father was Joseph L. Smith so it is likely that they were related. Posted from VICKSBURG, MISS. docketed Feb. 1st with a pair of Scott no. 7. Addressed to Mrs. Jane C. Jones, Port Gibson, mss. 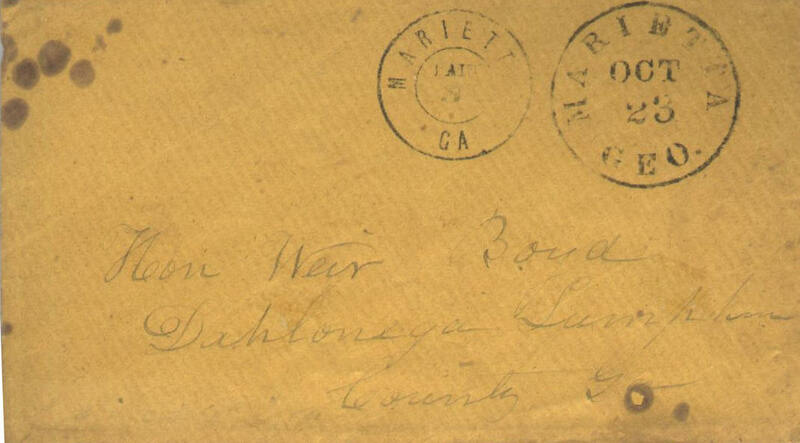 Posted from RALEIGH, N.C. June 28 probably 1864 with a single of Scott no.12a. Addressed to Judge Thos. Ruffin, Graham, Allamance Co., N. C.
South Carolina seceded on December 20, 1860. She joined the Confederacy on February 4, 1861. 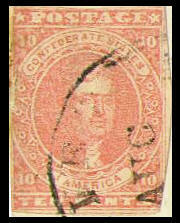 US stamps were valid until May 31, 1861. This cover was posted on April 8, 1861, four days before the Federal replenishment and the subsequent shelling of Fort Sumter and is franked by US Scott no. 26. 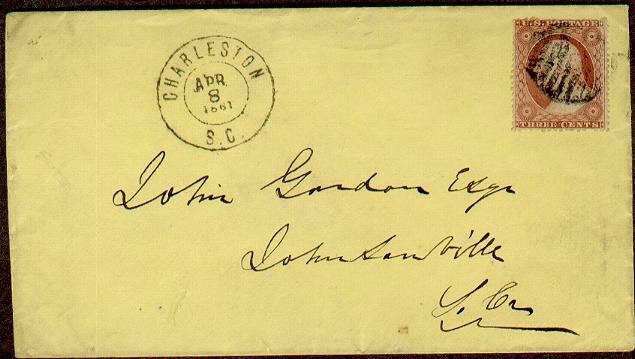 The cover is addressed to John Gordon Esq., Johnsonville, So. Ca. This was posted from CHARLESTOB, S.C., on March 31 1864 and bears a single Scotty no. 11. 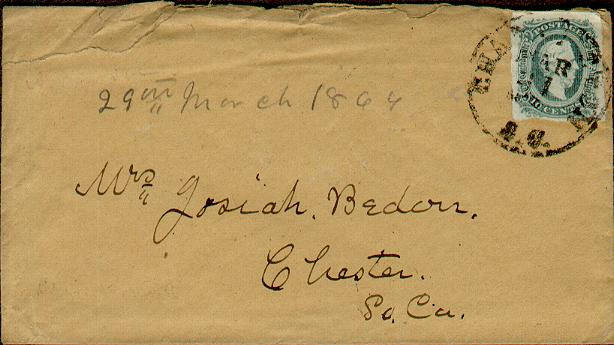 It is addressed to Mrs. Josiah Beders, Chester, So. Ca. 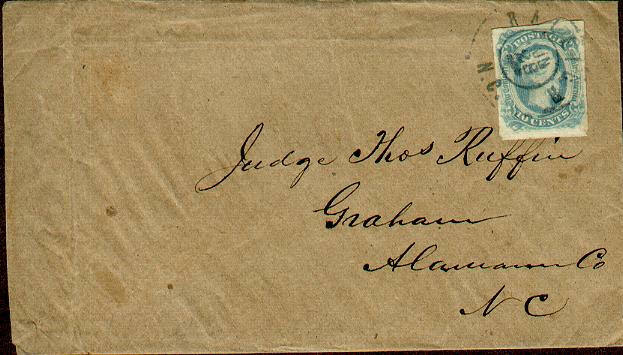 Mailed from KNOXVILLE, TENN on Oct. 2, 1862. Has a pair of Scott no. 6. 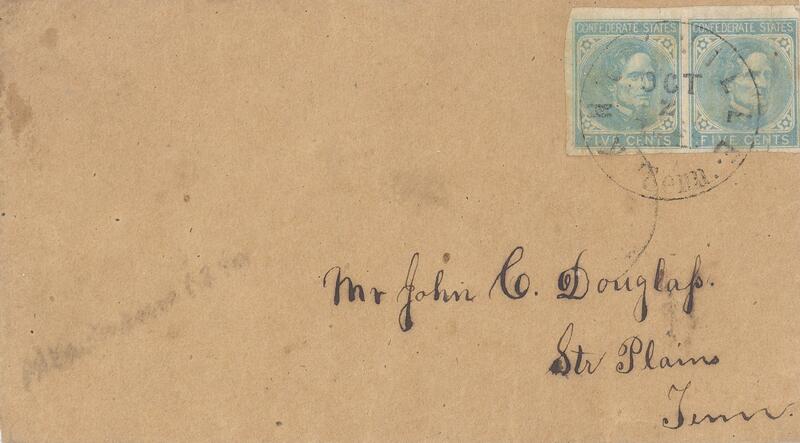 Addressed to Mrs. John C. Douglas, Str. Plains, Tenn.
Posted from HOUSTON, TEX.and bears a single Scott no. 12. It is addressed to Capt. J. W. Hubbard, Boston, Bowie Co, Texas. 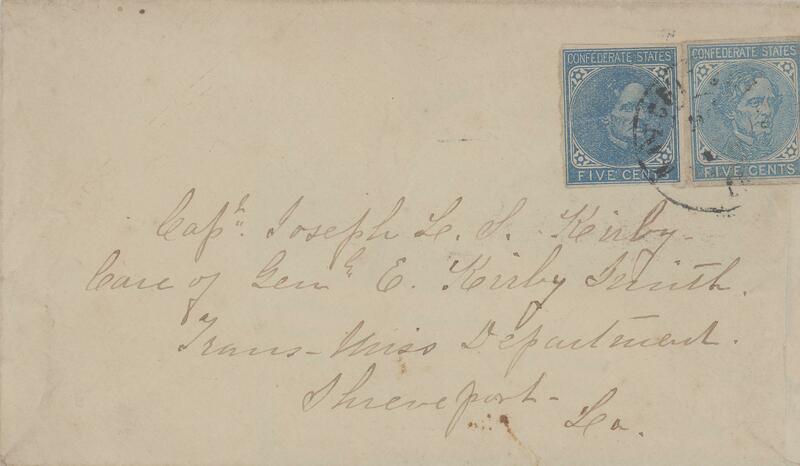 Posted from PORTSMOUTH, VA., on January 2, 1852 and bears a single Scott no. 1. 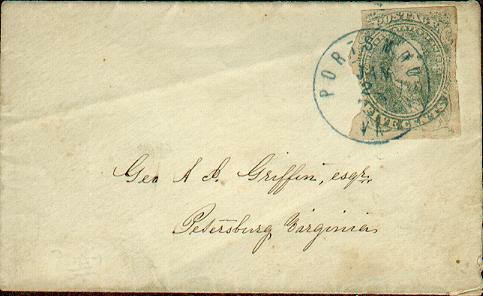 Addressed to Gen. A. S. Griffin Esq, Petersburg, Virginia. 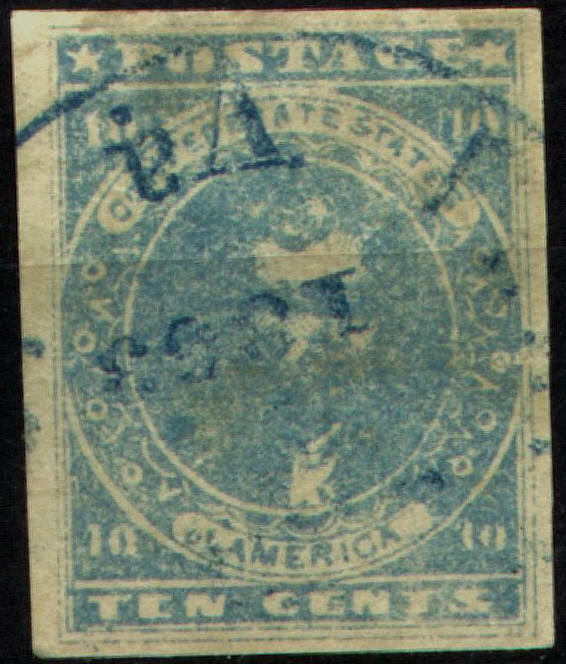 Army Field Post parallel bar cancellation on Scott no. 11. 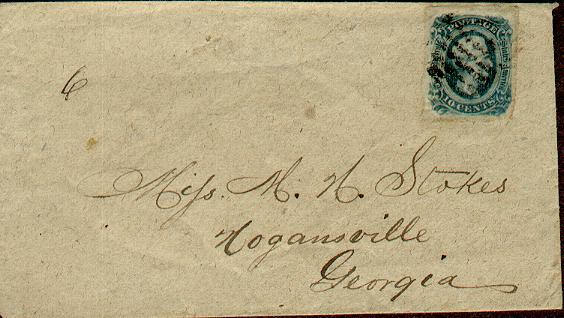 Addressed to Mrs. M. N. Stokes, Hogansville, Georgia. Army Field Post concentric circle cancellation on Scott no. 12d. Addressed to Miss Mary E. Blakemore, Sangerville, Augusts Co. Va. Soldier's letters could be sent postage due. This is an example. Note the soldier's information at the top right "Capt. U. C. Allen 21st Ga. Vols." 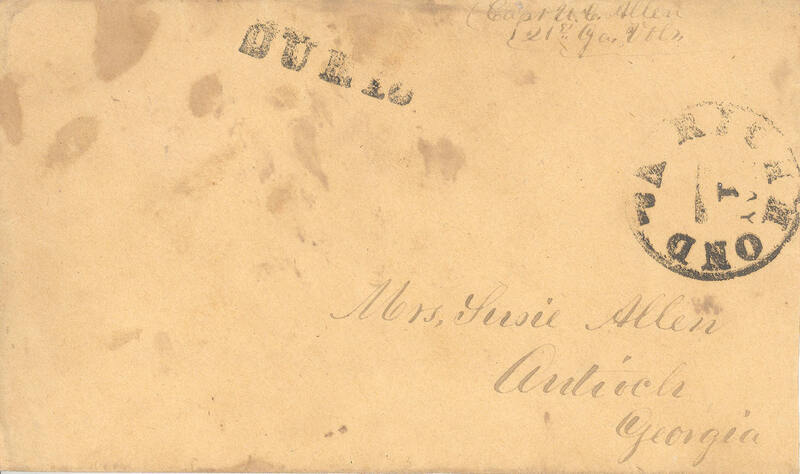 The cover was addressed to Mrs. Susie Allen, Antioch, Georgia. The cover has the DUE 10 marking and is postmarked RICHMOND VA MAY 1. 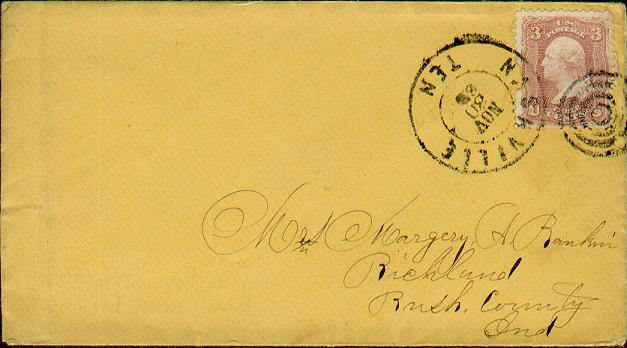 This interesti g cover was sent by a POW held at Point Comfort MD on October 17, 1864 franked with a US Scott no. 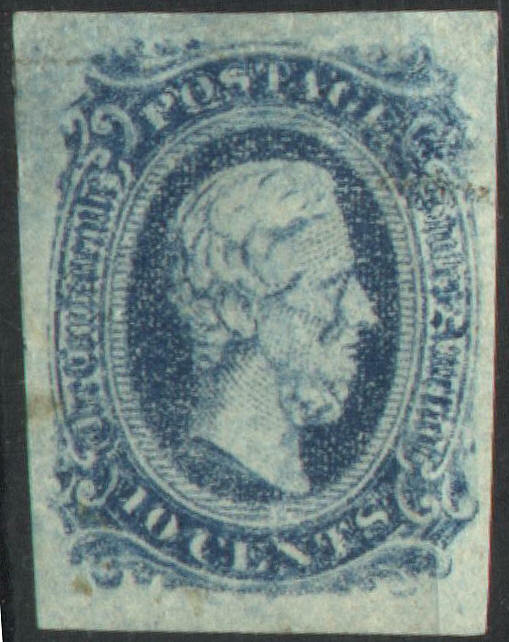 65 three cent stamp. It was sent through the lines "by flag of truce" to Richmond where a CSA Scott no. 11was added and postmarked RICHMOND VA NOV 1?. It was addressed to Miss Emma J. Lavinder, Martinsville, Henry County, Virginia. 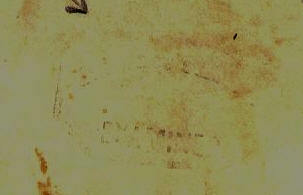 The scan does not show it clearly but the arrow points to a n octagonal PRISONER'S LETTER - EXAMINED handstamp. 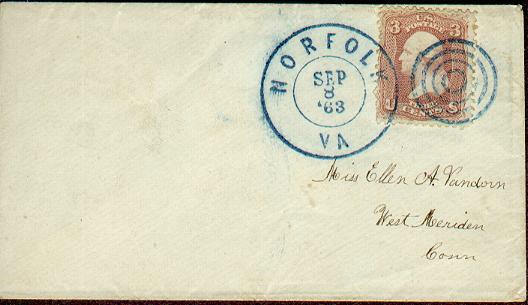 This leeter was sent from RICHMOND VA AUG 13 bearing a single Scott no. 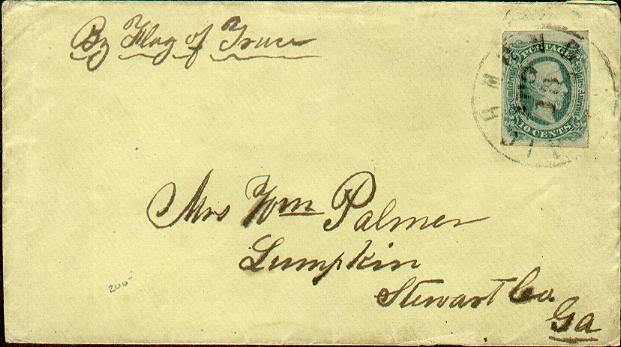 12 addressed to Mrs. Wm Palmer, Lumpkin, Stewart Co., Georgia. It is annotated By Flag of Truce indicating that it passed through Federal lines. Paper became scarce due to the Federal blockade. Many covers were homemade. Some were made from wallpaper, others from various forms. Many would open a used cover and remake it into a new envelope and reuse it. 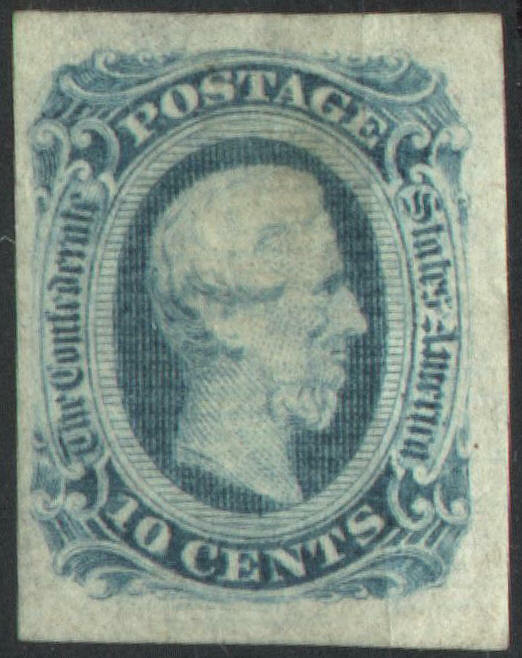 This is an example, the first usage had a Scott no. 12 sent from Jones, Ga., dated Feb. 26 addressed to G. W. Boatright, Pocataligo, SC Co c 12 Ga . Thee last usage had a pair of Scott no. 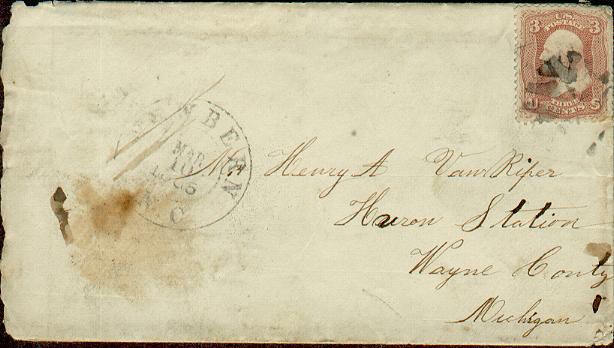 7 with a Savannah, Ga, postmark of May 2 (likely 1864). 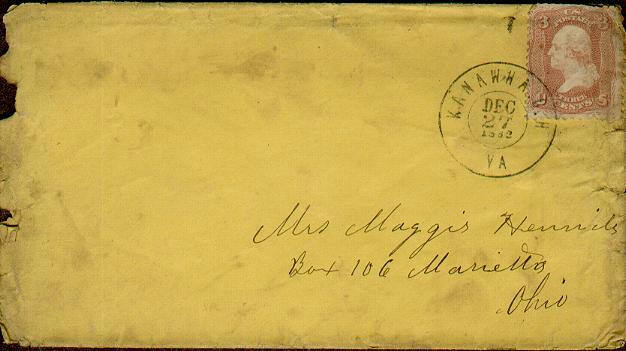 The reused cover was addressed to Miss Mattie Kemp, Stephansville, Georgia. 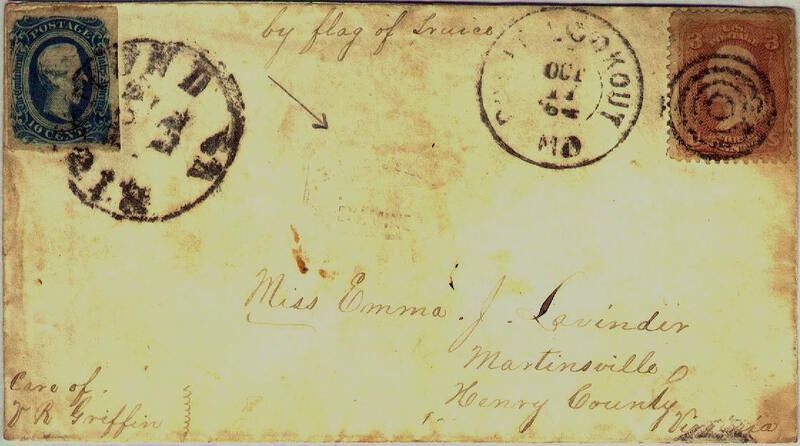 Confederate Government bureaus and departments had free franking privileges for official business mail. Here is an example from the WAR DEPARTMENT. 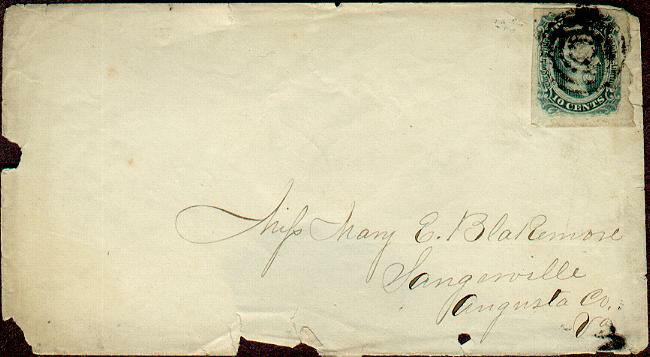 It is annotated as the return address "Secy of War / about the discharge of/Surgeon Dinplop (?) - 1863." It is addressed to His Excellancy Jos. E. Brown, Governr5 of Georgia, Milledgeville, Ga. 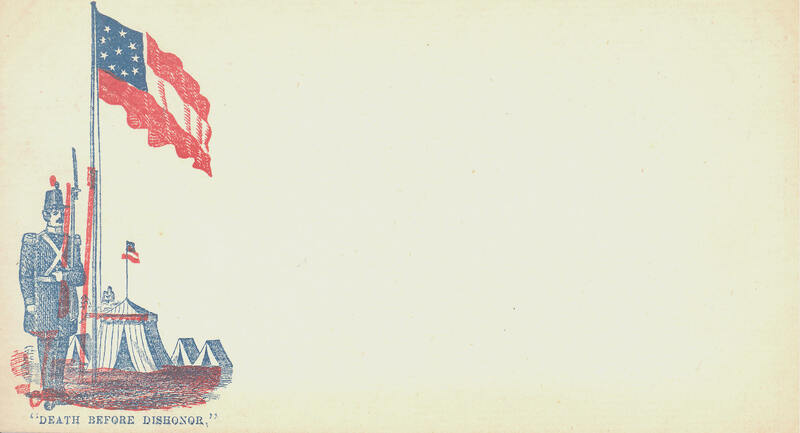 Both sides issued patriotic envelopes. This is an example of a Southern with a true patriotic motif. 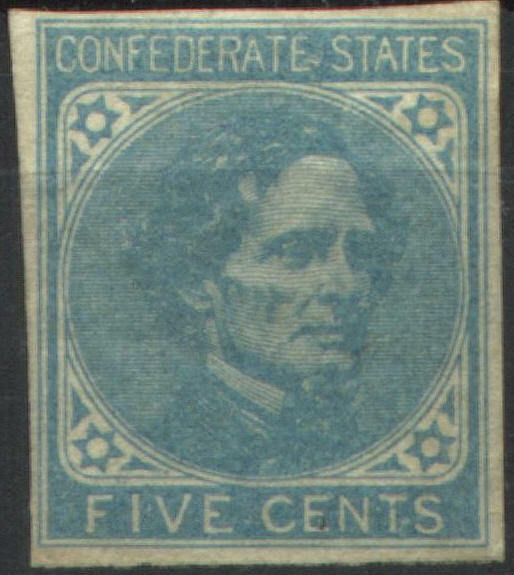 Note the flag has 10 stars so this was probably printed in late May or early June 1861 after North Carolina was admitted and before Tennessee was admitted to the Confederacy. The Northern ones were mainly very crude in demonizing the South for daring to declare independence from their Union. Rather than appeal to one's patriotism, they were designed instill hate. An example follows. I have included a few covers issued in Southern cities while under Federal occupation. New Bern N. C. postmarked Mar 10 1865. New Bern was captured by the invaders under Gen. Burnside on March 14, 1862. The Confederate forces tried to retake the city from February 1 to 3 `864 but were unsuccessful. The city remained under Federal occupation for the remainder of the War. 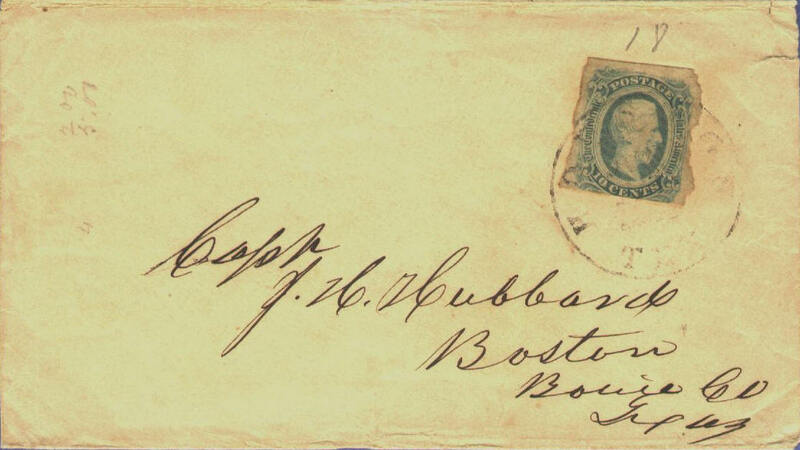 This cover was postmarked Mar 10 1865. Nashville TN was captured by the vandals in March 1863. Confederate forces tried to retake the city in December 1864 but failed. This cover was postmarked Nov 30 63. Norfolk VA was seized by the yankees on May 10 1862 and was held under Martial Law for the entirety of the War. This cover is postmarked Sep 8 63. Virginia seceded from the Union on April 17 1861 after Lincoln imposed conscription on the non-seceding States. She joined the Confederacy on May 7, 1861. The 39 northwestern counties of Virginia then voted to secede from the State of Virginia on August 20, 1861. Parts were recovered by Confederate forces in May and June 1862 but they were forced back in July. She was finally admitted to the Union on June 20 1863. Confederate force recaptured the city on September 12, 1862 but were forced to abandon it on October 28, 1862. This cover is postmarked KANAWHA C.H. VA DEC 27 1862.